For those following the John McCain / Barack Obama Presidential debates (and all the other online activity surrounding the McCain/Obama Election covered brilliantly by Nick Burcher), I came across a very curious website called "John McCain is your Jalopy". It simply consists of a white screen with a phrase that suggests (if it even needed doing!) 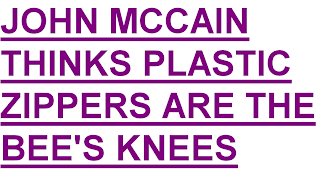 John McCain is an old man. The phrase that is showing is clickable to then produce another phrase. The site is in the same style as the various "Ridiculous Random facts about Chuck Norris" (or Vin Diesel, or Jack Bauer, etc) websites that I often quote on the wall of an old school friend's Facebook wall. "Chuck Norris can speak Braille" for example. I really enjoy these sorts of sites, especially when they enable visitors to add possible "facts" to the list.